I’ve had this parsley for over a month! If you’re tired of throwing away wilted parsley, you will love this easy way to store fresh parsley. Just put it in a glass of water and cover it loosely with a plastic produce bag. I use the bag I brought it home in from the store. Fresh parsley is great to use in cooking but I only use a little at a time. I used to keep it in the vegetable drawer in a plastic bag but I always had to throw it away before I could use it all up. There had to be a better way. So I tried putting it in a glass of water in the fridge and it kept a little longer but after a few days it was drying out. I’ll be using this parsley until 2015! I’ll let you know when it finally runs its course – probably six or seven weeks. I just had to share! 4 Comments on "How To Store Parsley"
I do the same thing; place a plastic bag loosely over the parsley and in the fridge and they end up getting soggy. I wish they’d last longer. Obviously, I’m doing something wrong. Any suggestions? 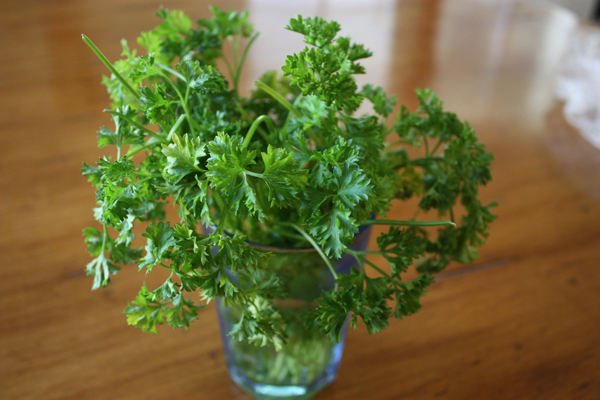 In the old country we used to keep parsley in a glass of water in a cold place (usually between window panes). 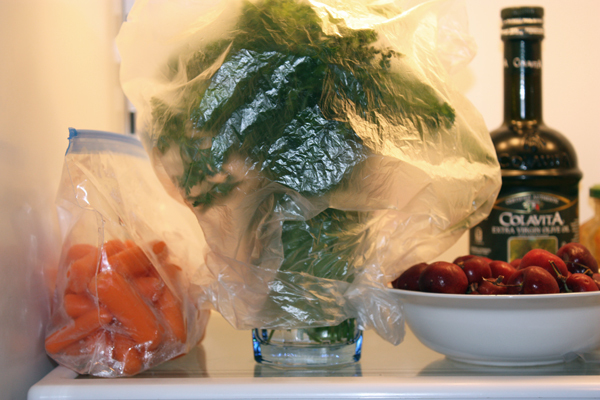 Today I’m keeping parsley, cilantro, etc., in a plastic bag, loosened fron the rubber band and rolled in a paper towel. It does keep for weeks. I think it’s import not to buy very wet greens, or make sure to dry them fairly well before wrapping.